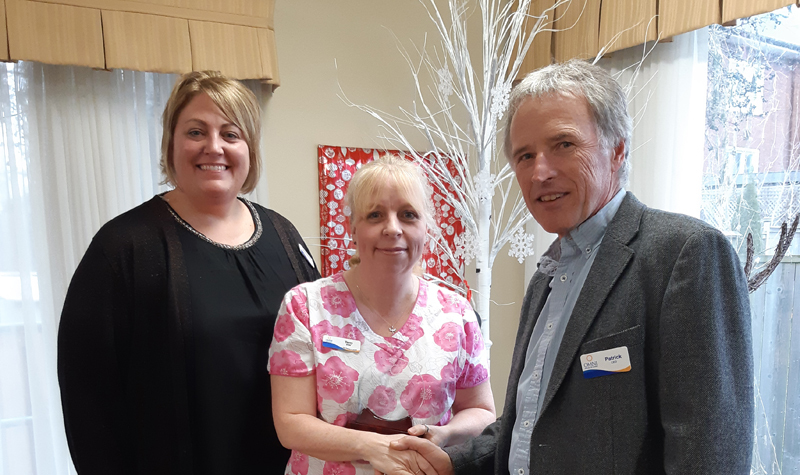 Personal support worker (PSW) Terry DeJong has been known around Streamway Villa as an excellent, resident-focused team member who works well with others since she started working at the Cobourg long-term care home 10 years ago. Her colleagues note this truly came to light earlier this year when Terry was chosen by her peers to complete a Yellow Belt LEAN project. “She joined and what a difference this has made in Terry’s confidence, knowledge and ability to adapt to change,” Terry’s colleagues say in a letter nominating her for Streamway Villa’s 2018 Everyday Hero Award. One of the major successes achieved by Terry and another PSW on the LEAN team was a re-evaluation of the evening master rotation line which resulted in job-routine changes to make Streamway Villa a better work environment, her colleagues say. As a result of her success with the LEAN project, Terry now wants to participate in some of the other educational opportunities Streamway Villa offers, and she recommends colleagues who would benefit from additional training, the team says. Terry was awarded the Everyday Hero at a recent ceremony held at Streamway Villa. Terry’s co-workers note how she delivers resident-focused care and always demonstrates a strong work ethic. She is also a natural leader when it comes to helping new staff members transition into their new job.